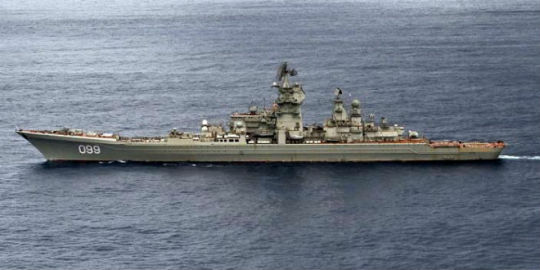 A Russian naval contingency led by the missile cruiser Pyotr Veliky has arrived in the Mediterranean Sea from the Atlantic Ocean, Russia’s Defense Minister General Sergey Shoigu said on Tuesday, according to a TASS report. “Last week, our ship-borne air strike force led by the missile cruiser Pyotr Veliky made a passage through the eastern Atlantic into the Mediterranean Sea. On October 27-29, support vessels replenished the naval group with all types of supplies to the required level,” Shoigu said, noting that the fact that “certain countries” refused to let his ships dock in their ports did not hinder the mission. “We were especially surprised by the position of certain countries which under the pressure of the US and NATO said in public they denied the request of our warships to call at their ports,” Shoigu said. According to Shoigu, the Russian forces which will regroup at the Khmeimim Russian airbase south-east of the city of Latakia, and at the Tartus naval maintenance base, in Syria, are well provided for, with 2,000 tons of goods that are delivered to them daily. The Russian Northern Fleet’s aircraft carrier group began its voyage to the north-eastern Atlantic and the Mediterranean Sea on October 15. According to data of the Northern Fleet’s press office, the group comprises the heavy aircraft carrier Admiral Kuznetsov, the heavy nuclear-powered missile cruiser Pyotr Veliky, the large antisubmarine warfare ships Severomorsk and Vice-Admiral Kulakov, and support vessels. Did Russia Just Fire the First Shot in the Super-Power Cyber-War? 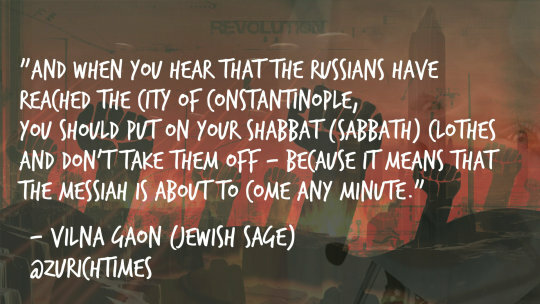 [ZurichTimes] If the Zionist State of Israel is getting worried about the approaching Russian Armada they should be because they have been dreading this day for a few hundred years. The arrival of the Russians means that a major World War in underway in the Levant even if the Main Stream Media Presstitutes do not want to report on it. We have finally arrived at that point in history and world affairs where the Zionist strangehold over the American Government, American Media and American People has finally been exposed and rehealed to the world. A soft coup has happened and guess what it was never the Russians after all. It was the alphabet soup UnIntelligent Agencies that are essentially fighting GangLand style “Turf Wars”. We are witnessing pure Gangsterism masquerading as Democracy. When in fact it has been “Demoncracy” as we have stated many times before – Rule by Demons for Demons. The Russians are the only and best version of the “Morality Police” we have left. Are they perfect and pure? No, but who would you rather be dealing with; Putin or the disgusting Pedophilia associated Hillary Clinton and the Clinton Cabal? The Prophecy of the Russians entering Turkey.